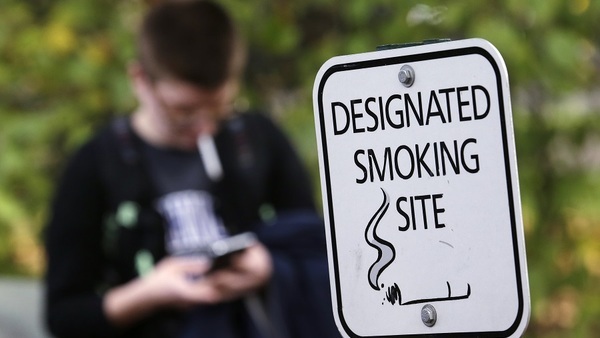 California becomes the first state to raise the smoking age to 21. Smoking has been on the decline for years, but California wants it to decline even faster. The Golden State is poised to become the first to raise the tobacco purchasing age to 21, a policy aimed at keeping cigarettes out of high school. The state legislature on Thursday approved the bill, which is expected to be signed by Gov. Jerry Brown. Other states have raised the purchasing age to 19, but no other state has come close to 21 yet. It’s a stark contrast with the drinking age, which has been 21 in every state for more than two decades, since the federal government tied state highway funds to the higher drinking age. Arguments in support of the bill centered on research that shows most smokers pick up the habit as teens, before they even turn 18. By raising the purchasing age to 21, not even high school seniors will be able to legally buy cigarettes, meaning they will also be less accessible to younger teens. Critics of the current drinking age have often argued that it is hypocritical that the government treats 18-year-olds as adults in just about every respect except alcohol consumption. They can vote, get married, and of course, serve in the military. In acknowledgement of that apparent contradiction, the California smoking law allows an exemption for those under the age of 21 who are in the armed forces. “This will save the (Medicaid) system in the outgoing years millions of dollars and it is going to save thousands of lives here in California,” assembly member Jim Wood, who wrote the bill, told the Wall Street Journal. Surveys have shown that the law has broad support among the public.